Every day of our lives, we have a choice – we can choose bright or we can choose dark. When things get depressing, I do two things. I shut out the news and only listen to silly programs on television. I can’t, simply can’t handle an endless run of sad stories, scary news, and depressing realities. The worse it gets, the harder I work to do the second thing – I look for happy and bright. That’s my nature and I’m probably not going to change it any time soon. Growing up, almost every Sunday my family would go to the park and play Frisbee, fly a kite, or kick around a ball. The kites we flew were all decorated with bright colors and would soar high above us. We would take turns watching them fly until, after a while, we’d pull them back to earth and store them away until the next week. Sadly, the Arabs in Gaza have a long history of taking the innocent and turning into a weapon. They’ve done that with ambulances, children’s toys, backpacks. They booby-trapped a zoo during one war. And now, now they are booby-trapping kites. Attaching explosives and molotov cocktails and flying them over Israel where they crash and set fire to fields. How dare they combine something as wonderful and bright as a kite, with fire and explosives? apparently the Arabs in Gaza are so happy about their ability to burn thousands of acres of land, they are now threatening to send in 1,500 explosive kites tomorrow. So what’s the most amazing story I saw today? A “young” couple moved to Israel recently. They are no strangers to this country. They’ve visited here something like 45 times. Only this time, it’s forever. 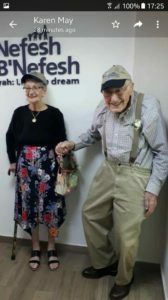 The couple, Doris and Norman Levitz are both 94 years old and I can only bless them with a happy and easy landing. May they live to 120 and enjoy every minute of it. Welcome to the Levitz’s – may your lives here by bright and light and full of fun.